The Bird Sanctuary is just north of the Greek Theater. From Loz Feliz Blvd., head north on Vermont Ave. into Griffith Park. There will be pull-in parking on your right. Park in one of the spots further up the hill. The Bird Sanctuary is at the first bend in the road. Look for Griffith Park Storytelling Series signs and arrows! There will be restrooms, and the entrance to the Bird Sanctuary is through the fence just to the left of the restrooms. We will be set up slightly up the trail. On Vermont Ave., there will be pull-in parking on your right. Park in a spot further up the hill, before the bend in the road. 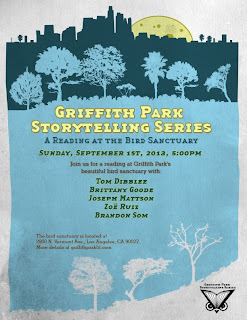 Look for the Bird Sanctuary sign, and for Griffith Park Storytelling Series' signs! There are restrooms just before the short trail to the reading. Go through the fence just left of the restrooms. Look for chairs in one of the dried out stream beds! Tom Dibblee's work has appeared or is forthcoming in Glimmer Train, the LA Review of Books, and The Point. He edits Trop at tropmag.com. Brittany Goode is a writer and publisher living in LA. Currently she is managing her obsession with pseudonyms. Joseph Mattson is the author of Eat Hell (Narrow Books) and Empty the Sun (Barnacle), a novel with soundtrack by Drag City recording artist Six Organs of Admittance, and finalist for the 2010 SCIBA Fiction Award, and also recently chosen by the LA Weekly as one of the best L.A. novels of all time. Mattson is the editor of and contributor to The Speed Chronicles (Akashic Books), which also features the work of Sherman Alexie, Beth Lisick, William T. Vollmann, James Franco, and more. Mattson's work has appeared in Slake, The Rattling Wall, Pearl, and others, with two recent works acknowledged in Houghton Mifflin's 2012 Best American series. He was the recipient of a prestigious 2011-2012 COLA Individual Artist Grant for his novel-in-progress, Hexico. Mattson is also at work on a memoir of his mother's death by homicide. He can be reached at josephfmattson@yahoo.com. Zoe Ruiz is the managing editor of The Rumpus and staff member of FOUND magazine. Her work has appeared in The Rumpus, Two Serious Ladies, and Trop. She's working on her interview project, "Learn People Better," and curates READINGS, a Los Angeles based reading series. When she is not writing, she teaches yoga. Brandon Som is the author of the chapbook Babel’s Moon, winner of the Tupelo Press Snowbound Prize. His poems have appeared in Prairie Schooner, Indiana Review, Black Warrior Review, and Octopus Magazine. He has been awarded fellowships to the Virginia Center for the Creative Arts and the Provincetown Fine Arts Work Center. His full-length collection The Tribute Horse was selected for the 2012 Nightboat Books Poetry Prize and will be published in the spring of 2014. 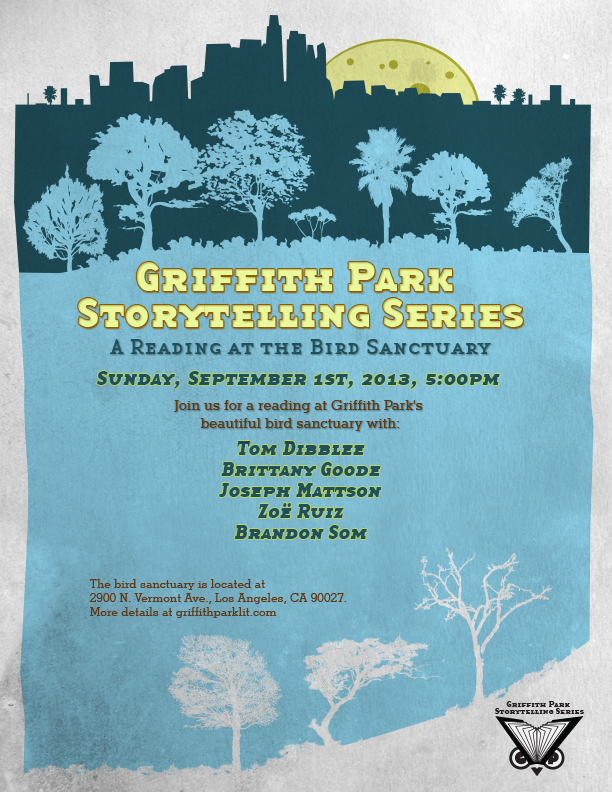 RSVP on Facebook: Griffith Park Storytelling Series - Bird Sanctuary Edition!